What can I do to help improve medication safety for patients with diabetes? 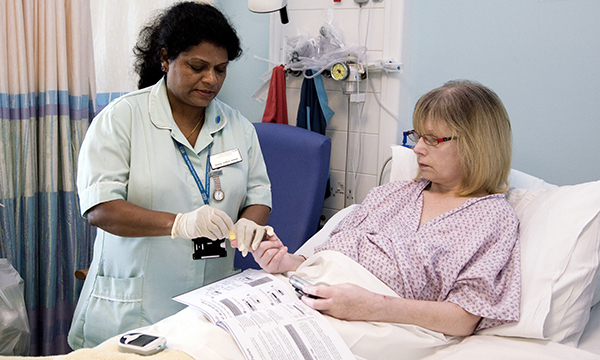 A new report from charity Diabetes UK, published in October, revealed worrying inadequacies in the care of hospital patients with diabetes. The report – Making Hospitals Safe for People with Diabetes – revealed that 260,000 inpatients with diabetes in England experienced a medication error during their hospital stay last year. Of these, 9,600 experienced a serious and potentially life-threatening episode of hypoglycaemia caused by poor insulin management. The prevalence of diabetes in England is increasing, with data from Diabetes UK showing that more than a million people with the condition were admitted to hospital in England last year. One in six hospital beds is currently occupied by someone with diabetes, a figure expected to rise to one in four over the next 12 years. The report calls for hospitals to implement six key requirements to make diabetes care in hospital safer for patients (see Box). These will help ensure patients have a better hospital experience and reduce their length of stay. Although many hospitals have some or all of the recommendations in place, it is in no way guaranteed across the NHS. A postcode lottery still exists, with some patients receiving a better service than others. As someone who lives with diabetes, this is very close to my heart. During recent hospital admissions in the UK and France, I have encountered staff who did not know how my insulin pump worked. I have also been concerned about the lack of close monitoring when I have been on sliding scale insulin infusions, I have witnessed delays in hospital patients getting their insulin on time due to lengthy drug rounds and delays in patients with diabetes getting their food. Some wards have ‘hypo boxes’ to ensure appropriate treatment can be given quickly if a patient has a hypoglycaemic episode. But I have also seen poor management of hypoglycaemia, with patients being given milk and sugar with biscuits instead of fast-acting sugars. Another high-risk area for the poor management of diabetes is patients’ own insulin pens being stored in a fridge with a used needle still attached. Insulin pens currently in use do not need to be refrigerated but they do need safe storage, with a new needle applied for each bolus dose. Multidose vials of insulin also need to be stored appropriately and used for only one patient. There is a serious risk of cross contamination when dirty needles are used to draw up insulin from a multidose vial. Carrying out blood sugar monitoring on hospital wards or units is a task often delegated by nurses to healthcare assistants (HCAs). If you do delegate glucose monitoring to an HCA, you must ensure they report back to you with any blood sugar recordings which are out of the normal range so that you can act accordingly; as the registrant, you are ultimately responsible for the patient’s care. In the community, some people with diabetes will re-use their insulin syringe and pen needles, partly because they have had to purchase these themselves in the past. But needles for insulin pens can be prescribed, and this practice should be heavily discouraged and a new needle used for each administration. There are many areas where mistakes or poor management of diabetes can occur. Hospital inpatients can help by self-managing their condition when they are well enough, but they may not have the cognitive ability or energy to do so when unwell. It is therefore down to us nurses to ensure that patients are given optimum diabetes care, both in hospital and in the community.